Before the end of the eighteenth century the trumpet was normally a simple length of tubing, folded back on itself to form a loop, and pitched either in C or D. The player was essentially limited to the notes of the harmonic series: the higher he ventured, the more notes became available, so leading to the cultivation of the upper clarino register. Until the middle of the seventeenth century trumpeters rarely participated in the mainstream of music. They played improvised fanfares in trumpet and drum bands and were usually thought of more as soldiers or court attendants than as musicians; they can still be observed in this role in Monteverdi’s Orfeo of 1607, though, unusually, their fanfare is written out. When composers first experimented with using trumpets in composed music – around 1620 – they still wrote for trumpet bands in a fanfare style, as some polychoral church works by Michael Praetorius and Heinrich Schütz show. The trumpet only began to be used regularly in concerted instrumental music in the 1660s, though it is difficult to know whether this crucial development occurred first in Italy or Germany. Cazzati published his Op 35 including La Bianchina in 1665, but the Austrian Heinrich Schmelzer had already published sonatas for two trumpets and six-part strings in 1662. Once the sonata or sinfonia for one or two trumpets, strings and continuo was established, however, it quickly became a popular genre in courts and churches on both sides of the Alps, and its characteristics – strong, square, diatonic melodies supported by simple, directional harmony – began to influence other types of music. Modern editions and recordings have tended to favour the works of Torelli, Gabrielli, Perti and other composers working at San Petronio in Bologna. For this recording I have tried to cast the net wider without minimizing the importance of the Bolognese repertory; some of the earliest and most interesting trumpet sonatas were written in other Italian cities such as Rome or Venice, or by Italians in northern Europe. 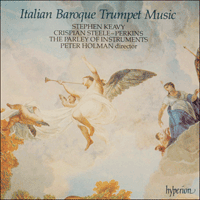 The earliest music on this record is by Girolamo Fantini, serjeant trumpeter at the Florentine court. All his surviving music is found in his 1638 trumpet tutor, published for some reason in Frankfurt. It looks both forwards and backwards: it has a number of sonatas of the Renaissance type that consist of a single melodic line to which lower parts were improvised, but it also has the earliest known music for trumpet and continuo – a series of short sonatas and dances. When a harpsichord rather than an organ is used, Fantini’s title-page seems to say (though the syntax is obscure) that the trumpet should be muted. The second-oldest piece – possibly the earliest concerted sonata with strings – is by Vincenzo Albrici. It is undated, but another work by Albrici in the same collection is dated 1654 and he was director of a group of Italian musicians at the Swedish court (the provenance of the Uppsala collection) from 1652 to 1654, so it probably dates from around then. Albrici led a hectic life: he was a Roman (a pupil of Carissimi) whose travels took him to (among other places) Stockholm, Dresden, Rome, Stralsund, Neuburg, London, Paris, Leipzig and Prague. His vigorous sonata appears to be, in part at least, a battle piece. Next in seniority probably comes the magnificent sonata for trumpet and two string choirs by Alessandro Stradella. This also survives in an undated manuscript, but its polychoral scoring is similar to a number of his Roman works, so it was most likely written before he left his native city for good in 1675. An early date is also suggested by the fact that the string groups are of equal size (unlike the later concerto grosso) and use the layout of violin, two violas and bass, not the more modern two violins, viola and bass; the actual music, however, is extraordinarily modern in its harmonic and melodic language. Stradella’s lurid life (he was murdered following an intrigue with a girl from a prominent Genoese family) has unjustly overshadowed the merits of his music. The short but eloquent sinfonia by Carlo Pallavacino reminds us that many early concerted instrumental works were originally introductions to vocal music; the sources that preserve them detached from their parent works represent the first stage of a process that was to establish the concerto and the symphony as genres in their own right. Il Diocletiano was the first of Pallavacino’s many Venetian operas, written shortly after a period spent working at the Dresden court as Heinrich Schütz’s assistant. Nicola Matteis was another Italian who worked in northern Europe: he arrived in London from his native Naples in the 1670s, where he made a fortune as a violinist and guitarist from performing, teaching and selling copies of his compositions. It is not easy to reconstruct the original form of his concerto, for it survives only in a curious arrangement made to fit the format of his violin books. The third trumpet part, for instance, cannot be played on the natural instrument and has been given here to the trombone; I have also reconstructed the lost string parts. The original piece is a rambling suite of seven movements, but the first three (performed here) make a satisfactory short work on their own. Francesco Mancini’s sinfonia was also known in London, for his opera was produced there under the title Hydaspes in 1710; it seems that the composer – also a Neapolitan – worked in England for a period. The sinfonia is typical of the simple, vigorous orchestral style popularized by Alessandro Scarlatti; the scoring, though, with solo violins as well as solo trumpet in the first movement, is quite sophisticated. The trumpet sonata by Arcangelo Corelli is virtually the only genuine work that was not included in his six printed collections. It too has English connections: it was published in London in 1704, and in 1713 a performance was advertised as containing ‘several pieces of Musick proper for the Trumpet particularly a Sonata Compos’d by Signor Corelli, on purpose for Mr Twiselton when he was at Rome’. Although Corelli is thought of as a Roman composer he was born in Fusignano near Bologna, and received his early training there; in Bologna, doubtless, he was introduced to the trumpet sonata idiom. Giovanni Buonaventura Viviani was born in Florence and spent most of his career up to the 1670s at the Innsbruck court. When he published his trumpet sonata in 1678 (one of two in a volume of violin works) he had recently returned to Italy and was engaged in directing opera and oratorio in Venice, Rome and Naples. His trumpet writing is unusual in that it uses the C trumpet (instead of the D instrument that was becoming standard in Italy at the time), and this suggests that he wrote it in Innsbruck. The declamatory nature of some of the movements – a neat mixture of recitative and fanfare – suggests that they were intended for a large church. Maurizio Cazzati established San Petronio in Bologna as an important centre for performing and printing concerted music, vocal and instrumental. The three trumpet sonatas in Op 35 are scored for trumpet, four-part strings and continuo, using the violin, two viola and bass layout. Cazzati states that they can be performed with the trumpet muted, which raises the pitch of the instrument (and the key of the string parts) to D; we have followed his suggestion since we offer a ‘chamber’ performance one-to-a-part instead of one employing the large forces that were available in San Petronio. Petronio Franceschini was born in Bologna – as his Christian name indicates – and spent his short working life there as a cellist. His trumpet sonata, one of only two surviving instrumental works, dates from the last year of his life and is one of the finest works in the Bolognese repertory, not least for its rhythmic energy and unusual harmonies – including the repeated use of A minor harmonies in a D major work. The rich scoring, with cello, trombone, ‘contrabasso’, theorbo and organ, is precisely specified in the original set of parts at Bologna. Giovanni Bononcini was also a cellist who started his career in Bologna, though he was born in Modena. He was evidently something of a prodigy, for in 1685 at the age of fifteen he published three collections of instrumental music, including four sinfonias with trumpets. Although these works are technically and musically advanced – they include some of the most difficult trumpet-writing in the Bologna repertory – they are so different from the works he wrote in London in the 1720s (he was Handel’s chief operatic competitor) that earlier scholars were disinclined to believe that they were the work of the same man. Bononcini’s sinfonia uses the same scoring as the Franceschini sonata, so we felt it appropriate to use the same battery of continuo instruments. Avant la fin du XVIIIe siècle, la trompette était un simple tuyau replié en boucle sur lui-même et accordé en ut ou en ré, qui limitait l’interprète aux notes de la série d’harmoniques: plus il se lançait dans l’aigu, plus les notes devenaient disponibles, d’où une certaine culture du clarino, le registre supérieur de la trompette. Tenus à l’écart de la musique courante jusqu’au milieu du XVIIe siècle, les trompettistes improvisaient des sonneries dans les fanfares et étaient généralement moins considérés comme des musiciens que comme des soldats ou des serviteurs de cour – rôle qui est encore le leur dans l’Orfeo de Monteverdi (1607), même si, pour une fois, leur sonnerie y est écrite en toutes notes. Vers 1620, lorsqu’ils commencèrent d’expérimenter l’usage de trompettes dans la musique composée, les musiciens continuèrent d’écrire pour des fanfares de trompettes dans un style de sonnerie, comme l’attestent certaines œuvres liturgiques polychorales de Michael Praetorius et de Heinrich Schütz. L’utilisation régulière de la trompette dans la musique instrumentale concertée ne débuta que dans les années 1660, et il est difficile de déterminer si cette évolution cruciale fut d’abord italienne ou allemande: Cazzati publia son op.35, où figure La Bianchina, en 1665, alors même que l’Autrichien Heinrich Schmelzer avait déjà publié des sonates pour deux trompettes et cordes à six parties (1662). Une fois établie, cependant, la sonate (ou la sinfonia) pour une ou deux trompettes, cordes et continuo devint vite un genre populaire dans les cours et dans les églises, des deux côtés des Alpes, et ses caractéristiques – des mélodies puissantes, consistantes, diatoniques, soutenues par une harmonie simple et directionnelle – influencèrent bientôt d’autres types de musique. Les éditions et les enregistrements modernes ayant souvent favorisé les œuvres des Torelli, Gabrieli et autres Perti en activité à San Petronio (Bologne), je me suis efforcé d’élargir les horizons, sans pour autant minimiser l’importance du répertoire bolonais – certaines des plus anciennes et des plus intéressantes sonates pour trompette furent écrites soit ailleurs, à Rome ou à Venise, par exemple, soit par des Italiens établis en Europe du Nord. La plus ancienne musique de cet enregistrement est de Girolamo Fantini, sergent trompette à la cour florentine. Son unique musique survivante se trouve dans son manuel de trompette (1638), publié, on ne sait pourquoi, à Francfort. Cet ouvrage, qui regarde et vers l’avenir et vers le passé, comporte un certain nombre de sonates de type «Renaissance», avec une seule ligne mélodique sur laquelle les parties inférieures étaient improvisées, mais aussi la plus ancienne musique pour trompette et continuo (une série de courtes sonates et danses). Quand l’orgue vient remplacer le clavecin, la page de titre de Fantini semble indiquer (nonobstant une syntaxe absconse) que la trompette doit être con sordina. La deuxième pièce la plus ancienne – peut-être la plus vieille sonate concertée avec cordes – est de Vincenzo Albrici. Nous en ignorons la date, mais le fait que le même recueil contenait une autre pièce d’Albrici datée de 1654, et le fait, aussi, que le compositeur dirigea un ensemble de musiciens italiens à la cour suédoise (d’où provient le recueil d’Uppsala) de 1652 à 1654, suggèrent qu’elle remonte probablement à cette époque. Albrici eut une vie fort mouvementée: Romain d’origine (il fut élève de Carissimi), il voyagea, entre autres, à Stockholm, Dresde, Rome, Stralsund, Neuburg, Londres, Paris, Leipzig et Prague. Sa vigoureuse sonate semble être, en partie du moins, une bataille. Troisième pièce la plus ancienne, la magnifique sonate pour trompette et deux chœurs de cordes d’Alessandro Stradella nous est, elle aussi, parvenue dans un manuscrit non daté. Mais son écriture polychorale, qui rappelle un certain nombre d’œuvres romaines du même compositeur, donne à penser qu’elle fut très probablement écrite avant que ce dernier ne quittât définitivement sa ville natale, en 1675. Ce que corroborent les deux groupes de cordes, de taille égale (contrairement à ce qui se passera dans le concerto grosso), dotés d’une distribution à l’ancienne – un violon, deux altos et basse – et non moderne (deux violons, alto et basse); ce qui n’empêche pas la musique d’avoir un langage mélodico-harmonique extraordinairement moderne. Stradella a vu sa vie tapageuse (il fut assassiné après avoir eu une liaison avec une jeune fille d’une grosse famille génoise) éclipser injustement les mérites de sa musique. La brève mais éloquente sinfonia de Carlo Pallavacino nous rappelle qu’à l’origine, maintes œuvres instrumentales concertées introduisaient de la musique vocale; les sources qui les conservent seules, séparées de leurs œuvres mères, constituent la première étape d’un processus qui allait asseoir le concerto et la symphonie comme des genres à part entière. Pallavacino écrivit Il Diocletiano, le premier de ses nombreux opéras vénitiens, peu après avoir été l’assistant de Heinrich Schütz à la cour de Dresde. Autre Italien qui travailla en Europe du Nord, le violoniste et guitariste napolitain Nicola Matteis quitta sa ville natale dans les années 1670 pour s’installer à Londres, où il fit fortune en jouant, en enseignant, mais aussi en vendant des copies de ses compositions. Il n’est guère facile de reconstituer la forme originelle de ce concerto, dont nous ne possédons plus qu’un curieux arrangement «formaté» pour les livres de violon de Matteis. La troisième partie de trompette, par exemple, ne peut être jouée sur l’instrument naturel – aussi l’avons-nous confiée au trombone; j’ai, en outre, reconstitué les parties de cordes perdues. La pièce originale est une suite décousue de sept mouvements, mais les trois premiers (interprétés ici) forment une œuvre brève satisfaisante en soi. La sinfonia de Francesco Mancini était également connue à Londres, où l’opéra de ce compositeur fut monté en 1710 sous le titre de Hydaspes. Il semble que Mancini, Napolitain lui aussi, ait travaillé un temps en Angleterre. Cette sinfonia, typique du style orchestral simple et vigoureux popularisé par Alessandro Scarlatti, présente cependant une écriture fort sophistiquée, avec violon, mais aussi trompette, solo (premier mouvement). La sonate pour trompette est pratiquement la seule pièce authentique d’Arcangelo Corelli à ne pas figurer dans les six recueils imprimés du compositeur. Elle présente, elle aussi, des liens avec l’Angleterre: elle fut publiée à Londres en 1704 et, en 1713, un concert fut annoncé avec «plusieurs pièces de musique convenant à la trompette, notamment une Sonate composée par le Signor Corelli, exprès pour Mr Twiselton quand il était à Rome». Bien que considéré comme un compositeur romain, Corelli était né à Fusignano, près de Bologne, ville de sa première formation, mais aussi, sans nul doute, de son initiation à l’idiome de la sonate pour trompette. Giovanni Buonaventura Viviani naquit à Florence mais passa l’essentiel de sa carrière à la cour d’Innsbruck, où il demeura jusque dans les années 1670. Il publia sa sonate pour trompette (l’une de ses deux sonates parues dans un recueil d’œuvres pour violon) en 1678, juste après son retour en Italie, à une époque où il participa à la direction d’opéras et d’oratorios à Venise, à Rome et à Naples. Son écriture de trompette a ceci d’insolite qu’elle recourt à l’instrument en ut (et non à celui en ré, qui devenait alors la norme en Italie), laissant à penser que cette pièce fut composée à Innsbruck. La nature déclamatoire de certains mouvements – élégant mélange de récitatifs et de fanfares – suggère qu’ils étaient destinés à une grande église. Maurizio Cazzati fit de San Petronio (Bologne) un important centre d’interprétation et d’édition de musique concertée, vocale comme instrumentale. Des trois sonates pour trompette de l’op.35, écrites pour trompette, cordes à quatre parties et continuo, avec la distribution «violon, deux altos et basse», Cazzati dit qu’elles peuvent ête interprétées avec la trompette con sordina, ce qui élève le ton de l’instrument (et la tonalité des parties de cordes) à ré. Nous avons suivi cette suggestion et proposons donc une exécution de «chambre», avec un instrument par partie – et non les effectifs imposants qui étaient ceux de San Petronio. Comme son prénom l’indique, Petronio Franceschini naquit à Bologne, où il fut toute sa courte vie violoncelliste. Sa sonate pour trompette, l’une de ses deux seules œuvres instrumentales à nous être parvenues, date de la dernière année de sa vie et compte parmi les plus belles pièces du répertoire bolonais grâce, notamment, à son énergie rythmique et à ses harmonies insolites – tel l’usage répété d’harmonies de la mineur dans une pièce en ré majeur. La riche instrumentation, avec violoncelle, trombone, «contrabasso», théorbe et orgue, est stipulée avec précision dans l’original du corpus des parties, à Bologne. Bien que natif de Modène, Giovanni Bononcini débuta sa carrière de violoncelliste à Bologne. Il tenait à l’évidence du prodige puisqu’il avait seulement quinze ans lorsqu’il publia, en 1685, trois recueils de musique instrumentale, incluant quatre sinfonias avec trompettes. Ces œuvres, techniquement et musicalement avancées – leur écriture de trompette est l’une des plus ardues du répertoire bolonais –, diffèrent cependant de celles que Bononcini écrivit à Londres dans les années 1720 (il était alors le principal concurrent de Hændel en matière d’opéras), à telle enseigne que les premiers spécialistes peinaient à les croire du même homme. Cette sinfonia recourant à la même instrumentation que la sonate de Franceschini, nous avons utilisé la même batterie d’instruments de continuo pour les deux œuvres. Bis zum Ende des achtzehnten Jahrhunderts bestand die Trompete gewöhnlich aus einem einfachen Rohrstück, zu einer Schlaufe gebogen und entweder in C oder D gestimmt. Der Interpret musste sich im wesentlichen auf die Noten der Obertonreihe beschränken: Je höher er sich hinauf wagte, desto mehr Töne standen ihm zur Verfügung, was zur Beliebtheit des hohen Clarino-Registers beitrug. Bis zur Mitte des siebzehnten Jahrhunderts waren Trompeter selten an den gängigen Musikformen beteiligt. Sie spielten in Trompeten- und Trommelkollegien improvisierte Fanfaren und wurden gewöhnlich eher als Soldaten oder Wachleute bei Hofe statt als Musiker angesehen; in dieser Funktion treten sie noch in Monteverdis Orfeo von 1607 auf, auch wenn ihre Fanfare entgegen der üblichen Gepflogenheiten ausgeschrieben ist. Als Komponisten um 1620 erstmals mit dem Einsatz von Trompeten in komponierter Musik experimentierten, schrieben sie noch im Fanfarenstil für Trompetenkollegien, wie aus einigen mehrchörigen Kirchenwerken von Michael Praetorius und Heinrich Schütz zu ersehen ist. Erst in den 1660er-Jahren begann man die Trompete regelmäßig in konzertanter Instrumentalmusik zu verwenden, obwohl man nicht genau sagen kann, ob diese wichtige Entwicklung zuerst in Italien oder in deutschen Landen in Erscheinung trat. Cazzati veröffentlichte sein op. 35 einschließlich La Bianchina im Jahre 1665, aber der Österreicher Heinrich Schmelzer hatte bereits 1662 Sonaten für zwei Trompeten und sechsstimmige Streicher herausgebracht. Doch als sich die Sonate oder Sinfonia für eine oder zwei Trompeten, Streicher und Continuo erst einmal etabliert hatte, wurde sie rasch zur beliebten Gattung an den Höfen und in Kirchen beiderseits der Alpen, und ihre typischen Merkmale – kräftige, regelmäßige, diatonische Melodien, unterlegt mit schlicht ausgerichteter Harmonik – beeinflussten bald andere Musikformen. Moderne Ausgaben und Aufnahmen auf Tonträger haben allgemein die Werke von Torelli, Gabrielli, Perti und anderen Komponisten bevorzugt, die an der Basilika San Petronio in Bologna tätig waren. Für die vorliegende Einspielung habe ich mich bemüht, das Netz etwas weiter zu spannen, ohne die Bedeutung des Bologneser Repertoires herabzumindern; einige der frühesten und interessantesten Trompetensonaten entstanden in anderen italienischen Städten wie Rom und Venedig, oder sie stammen von Italienern, die in Nordeuropa wirkten. Die älteste Musik unserer Aufnahme ist von Girolamo Fantini, Oberhoftrompeter am Hof von Florenz. All seine erhaltenen Kompositionen finden sich in seiner Trompetenschule von 1638, aus unerfindlichen Gründen in Frankfurt publiziert. Sie blickt in die Zukunft wie in die Vergangenheit: In ihr sind einige Sonaten im Renaissancestil enthalten, die aus einer einzelnen Melodielinie bestehen, zu der Unterstimmen improvisiert wurden, aber auch die älteste uns bekannte Musik für Trompete und Continuo – eine Serie kurzer Sonaten und Tänze. Wo ein Cembalo statt einer Orgel zum Einsatz kommt, scheint Fantinis Titelblatt zu fordern, dass die Trompete zu dämpfen sei (auch wenn der Satzbau der Anweisung schwer verständlich ist). Das zweitälteste Stück – womöglich die früheste mehrstimmige Sonate mit Streichern – stammt von Vincenzo Albrici. Es ist undatiert, aber ein anderes Werk von Albrici in derselben Sammlung trägt die Jahreszahl 1654, und er leitete von 1652 bis 1654 eine Gruppe italienischer Musiker am schwedischen Hof (wo die Uppsala-Sammlung ihren Ursprung hatte), was es wahrscheinlich macht, das es zu dieser Zeit entstand. Albricis Leben war von Betriebsamkeit geprägt: Er war ein Römer (und Schüler von Carissimi), dessen Reisen ihn (unter anderem) nach Stockholm, Dresden, Rom, Stralsund, Neuburg, London, Paris, Leipzig and Prag führten. Seine schwungvolle Sonate war offenbar zumindest teilweise als Schlachtenmusik gedacht. Das vom Alter her nächste Werk ist wohl die großartige Sonate für Trompete und zwei Streicherchöre von Alessandro Stradella. Auch sie ist als undatiertes Manuskript erhalten, doch ihr mehrchöriger Satz ähnelt einigen seiner römischen Werke, d.h. sie wurde höchstwahrscheinlich vor seiner endgültigen Abreise aus der Stadt im Jahre 1675 geschrieben. Ein frühes Entstehungsdatum lässt sich auch daraus entnehmen, dass die Streichergruppen (im Gegensatz zum späteren Concerto grosso) gleich groß sind und sich aus Violine, zwei Bratschen und Bass statt der später üblichen zwei Violinen, Bratsche und Bass zusammensetzen; die Musik selbst ist von ihrer Harmonik und Melodik her ausgesprochen modern. Stradellas aufsehenerregendes Leben (er wurde infolge einer Intrige mit einem Mädchen aus prominenter Genueser Familie ermordet) hat ungerechterweise die Meriten seiner Musik überschattet. Die kurze, aber ausdrucksvolle Sinfonia von Carlo Pallavacino erinnert daran, dass viele frühe instrumentale Ensemblestücke ursprünglich als Einleitungen zu Vokalmusik gedacht waren; die Quellen, in denen sie getrennt von ihren Mutterwerken erhalten sind, stellen die erste Stufe in einem Prozess dar, der das Instrumentalkonzert und die Sinfonie als eigenständige Gattungen etablieren sollte. Il Diocletiano war die erste von Pallavacinos zahlreichen venezianischen Opern und entstand kurz nach einem Aufenthalt am Dresdner Hof, wo er als Assistent von Heinrich Schütz wirkte. Nicola Matteis war ein weiterer Italiener, der in Nordeuropa tätig war: Er traf in den 1670er-Jahren aus seiner Heimat Neapel in London ein, wo er sich als Geiger und Gitarrist mit Konzerten, Unterricht und dem Verkauf von Exemplaren seiner Kompositionen ein ansehnliches Vermögen erwarb. Es fällt schwer, die ursprüngliche Form seines Konzerts zu rekonstruieren, denn es ist nur als eigenartiges, an das Format seiner Geigenbücher angepasstes Arrangement erhalten. Die dritte Trompetenstimme ist beispielsweise auf der Naturtrompete nicht spielbar und wurde hier der Posaune übertragen; darüber hinaus habe ich die verloren gegangenen Streicherstimmen rekonstruiert. Das ursprüngliche Stück ist eine eher zusammenhanglose siebensätzige Suite, doch die ersten drei Sätze (die wir hier vorstellen) bilden für sich genommen ein zufriedenstellendes kurzes Werk. Auch die Sinfonia von Francesco Mancini war in London bekannt, denn seine Oper wurde dort 1710 unter dem Titel Hydaspes aufgeführt; wie es scheint, war der – ebenfalls aus Neapel stammende – Komponist einige Zeit lang in England tätig. Die Sinfonia ist typisch für den schlichten, robusten Orchesterstil, der von Alessandro Scarlatti bekannt gemacht wurde; die Instrumentierung mit Sologeigen sowie Solotrompete im Kopfsatz ist hingegen recht hoch entwickelt. Die Trompetensonate von Arcangelo Corelli ist praktisch das einzige authentische Werk von ihm, das nicht in seinen sechs im Druck erschienenen Sammlungen enthalten ist. Sie hat ebenfalls Bezüge zu England: Sie wurde 1704 in London publiziert, und 1713 wurde eine Aufführung angekündigt, die „mehrere der Trompete zugedachte Musikstücke“ umfassen sollte, „insbesondere eine von Signor Corelli komponierte Sonate, speziell für Mr. Twiselton während dessen Aufenthalt in Rom verfasst“. Obwohl Corelli allgemein als römischer Komponist gilt, wurde er in Fusignano bei Bologna geboren und erhielt dort auch seinen ersten Unterricht; zweifellos machte man ihn in Bologna mit der Gattung der Trompetensonate bekannt. Giovanni Buonaventura Viviani wurde in Florenz geboren und verbrachte einen Großteil seines Berufslebens bis in die 1670er-Jahre am Innsbrucker Hof. Als er 1678 seine Trompetensonate herausbrachte (eine von zweien in einem ansonsten Geigenkompositionen gewidmeten Band), war er kurz zuvor nach Italien zurückgekehrt und damit beschäftigt, in Venedig, Rom und Neapel Opern und Oratorien zu dirigieren. Sein Trompetensatz ist insofern ungewöhnlich, als er die C-Trompete zum Einsatz bringt (statt des Instruments in D, das sich zu jener Zeit gerade in Italien durchsetzte), was darauf schließen lässt, dass er das Stück in Innsbruck schrieb. Das Deklamatorische einiger Sätze – eine gelungene Mischung aus Rezitativ und Fanfaren – deutet darauf hin, dass sie für eine große Kirche gedacht waren. Maurizio Cazzati etablierte San Petronio in Bologna als bedeutendes Zentrum für die Aufführung und Herausgabe konzertanter Vokal- und Instrumentalmusik. Die drei Trompetensonaten seines op. 35 sind mit Trompete, vierstimmig geführten Streichern und Continuo besetzt, wobei die Aufteilung in Violine, zwei Bratschen und Bass benutzt wird. Cazzati erklärt, sie könnten mit gedämpfter Trompete gespielt werden, was die Tonhöhe des Instruments (und die Tonart der Streicherparts) nach D versetzt; wir sind seinem Vorschlag gefolgt, da wir eine „Kammeraufführung“ mit einem Instrument pro Stimme bieten, statt des großen Ensembles, das in San Petronio zur Verfügung stand. Petronio Franceschini wurde in Bologna geboren – wie schon sein Vorname andeutet – und verbrachte sein kurzes Berufsleben dort als Cellist. Die Trompetensonate, eines von nur zwei erhaltenen Instrumentalwerken aus seiner Feder, entstammt seinem letzten Lebensjahr und ist eines der wertvollsten Werke des Bologneser Repertoires, nicht zuletzt ob ihrer rhythmischen Energie und ungewöhnlichen Harmonik – einschließlich des wiederholten Einsatzes von a-Moll-Harmonien in einem D-Dur-Werk. Die üppige Besetzung mit Cello, Posaune, „contrabasso“, Theorbe und Orgel ist in den in Bologna aufbewahrten Originalstimmbüchern genaustens vorgeschrieben. Giovanni Bononcini war ebenfalls ein Cellist, der seine Laufbahn in Bologna begann, auch wenn er aus Modena stammte. Er muss als Wunderkind gegolten haben, denn 1685 veröffentlichte er im Alter von fünfzehn Jahren drei Sammlungen mit Instrumentalmusik, darunter vier Sinfonien mit Trompeten. Obwohl diese Werke satztechnisch und musikalisch fortgeschritten sind – sie enthalten einige der schwierigsten Trompetensätze des Bologneser Repertoires – unterscheiden sie sich so sehr von den Werken, die er in den 1720er-Jahren in London schrieb (dort war er Händels Hauptkonkurrent auf dem Gebiet der Oper), dass Musikforscher früher zweifelten, ob es sich um Kompositionen des gleichen Mannes handeln könne. Bononcinis Sinfonia verwendet die gleiche Besetzung wie jene von Franceschini, darum hielten wir es für angebracht, auch die gleiche Gruppe von Continuo-Instrumenten einzusetzen.